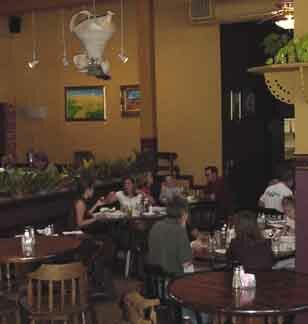 Phantom Canyon Brewing Co. is located in the heart of downtown Colorado Springs in the historic Cheyenne Building. The three-story brick structure was built in 1901 and housed the Chicago Rock Island and Pacific Railroad. In 1909, the building was re-opened as the Cheyenne Hotel. After the hotel shut down, the building changed hands a number of times and was used for a variety of business ventures. Saved from the wrecking ball in 1993, the historic site was purchased by John Hickenlooper who restored the property and opened Phantom Canyon Brewing Co. The main dining area and brewery were the first to open and were a great success. 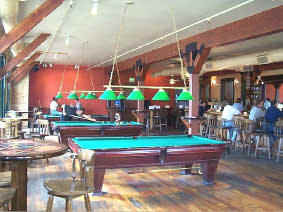 In 1995 we opened the second floor Billiard Hall which has been voted the Best Place to Shoot Pool every year since. In 2001 we completed our newest expansion, (and our last, were out of room!) 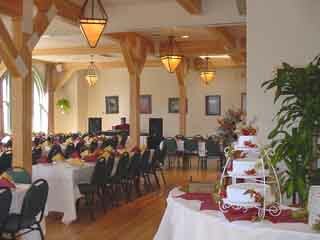 the third floor Banquet Hall. 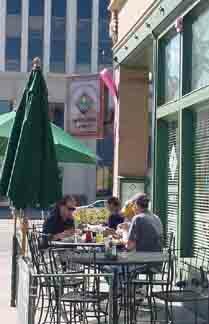 Today the restaurant is one of the most popular dining spots in the city and is credited with the revitalization of the downtown area. Required for parties of eight or more. Call 719-635-2800. 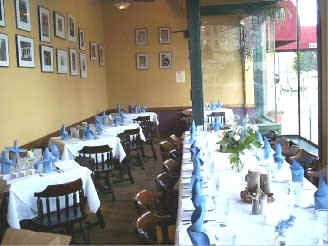 The Sun Room is available for private parties of 20 to 40. 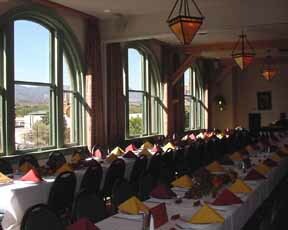 Phantom Canyon Banquet Hall occupies the entire third floor, with a full-size kitchen and a private bar dedicated exclusively to the needs of our banquet guests. Rows of arched windows offer stunning views; wood floors, vintage tile inlays, and twelve-foot ceilings create an elegant atmosphere. The space is versatilerooms can be configured to host groups from 25 to 200. Dinner parties, breakfast meetings, cocktail parties, rehearsal dinners, wedding receptions, corporate functions, and reunions are just a taste of the possibilities available in the Banquet Hall. Enjoy your visit to the PHANTOM CANYON BREWING CO! Phantom Canyon was featured in an 8-page article in Brew Magazine in 1996: ..."Today, beer lovers rush to Colorado Springs and Phantom Canyon Brewing Co. crying 'Great Beer and Damn Good Food"! Copyright Restauranteur, 2002-2019. All rights reserved.